That Lionel Messi had a frustrating evening against Iceland in Argentina's 2018 World Cup opener is a tale by now. The missed penalty, the eventual 1-1 draw and as Cristiano Ronaldo fans are claiming, the Portuguese's hat-trick performance as day ago, Messi has not had a very pleasant beginning in Russia. Having announced his retirement after the 2016 Copa America final loss to Chile, Messi reversed his decision and is now at perhaps his last World Cup to fulfill his dream of a trophy with his country. 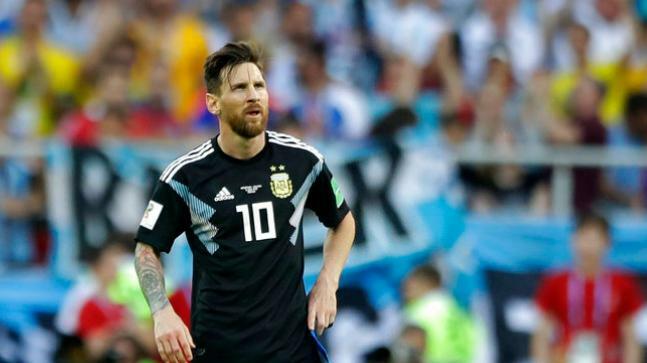 Messi is well and truly contemplating his retirement after this tournament but Saturday's dreadful start was far from a fairytale. Messi attempted a total of 11 shots against Iceland, out of which three of them were on target, and that is the most number of shots he has ever attempted in a single World Cup but still failed to score. Only Italy's Luigi Riva has attempted more shots in a World Cup than what Messi tried last evening, without scoring. Riva took 13 shots each against Sweden and Israel in the 1970 World Cup. Messi's frustrating night can be compounded by the fact that the last time he took these many shots without scoring in a competitive game for club or country was in December 2017 for Barcelona against Deportivo de La Coruna. Messi's missed penalty brought back memories of the shocking miss during the 2016 Copa America final -- one that cost Argentina the chance to lift the title. Last evening, it was not the title but surely cost Argentina the match. With Ronaldo scoring a good penalty on Friday, his fans got a chance to troll Messifor missing another and his record with penalties over the last few times does not help the Argentine. For both Barcelona and Argentina, Messi has missed four of the last seven penalties he has taken, and it brings to light a little question, should Messi be taking the penalties? It is a hardly contested fact that Messi is extremely dangerous with free kicks. His scoring rate with free kicks is sensational while penalties throw in some embarrassing numbers. On top of that, Messi on Saturday, attempted seven more shots than Ronaldo did against Spain. Yet the Portuguese got a hat-trick under his bag while Messi walked back empty-handed. "It would have changed the script. It was the advantage. Obviously it hurts me to have missed the penalty," Messi said after the match. Argentina coach Jorge Sampaoli also failed to evaluate Messi's performance saying that he endured a difficult night due to Iceland's defensive mindset. "To evaluate and characterise Lionel Messi's work is difficult because it was an uncomfortable match for him," Sampaoli said. "Iceland played very defensively, blocking all spaces but we did everything we could to win. Leo is very committed to Argentina." Argentina play Croatia next on June 21 and like Messi said "we will try to pass this quickly." That will be his one huge motto.